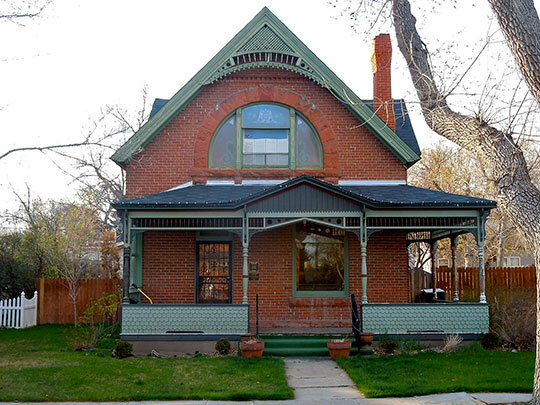 Photo: Smith House, 414 Evans Street, Cheyenne, WY. Located in the Keefe Row Historic District. The Historic District was listed on the National Register of Historic Places in 1979. Photographed by User:Smallbones (own work), 2011, [cc-by-1.0 (http://creativecommons.org/publicdomain/zero/1.0/deed.en)], via Wikimedia Commons, accessed August, 2014. Historians agree that the name Wyoming is an adaptation of an Indian word, however, there is wide disagreement on its translation. Big River Plain and Alternating Mountains and Valleys are two interpretations often cited. "Every woman of the age of twenty-one years residing in this territory, may, at every election, cast her vote; and her right to the elective franchise and to hold office under the election laws of the territory shall be the same as those of the electors." During the first few years of Wyoming's existence as a territory, considerable dissatisfaction was manifested over the appointment of non-residents to conduct the territorial government. After a while this dissatisfaction disappeared, at least so far as open expression was concerned, through there were many of the resident population who cherished the dream of the time to come then they would be able to have a state government of their own. The census of 1880 showed Wyoming's population to be 20,789, and the talk of asking Congress to pass an act admitting Wyoming to statehood began. Nothing definite was done, however, until February 7, 1888, when a memorial was introduced into the Territorial Legislature. Through the influence of Joseph M. Carey, then the delegate for Wyoming in Congress, a bill was introduced "to provide for the formation and admission into the Union of the State of Wyoming and for other purposes." A bill was also introduced in the House to enable Wyoming and certain other territories to form constitutions and state governments. On February 27, 1889, the senate committee on territories reported the bill back to that body, and the house bill was also favorably reported by the committee on territories, but the session of Congress came to an end on the 4th of March and the bill failed to pass for lack of time to give it the necessary and customary consideration. The people of Wyoming, firm in the belief that, had time permitted, the enabling act would have been passed, and equally firm in the belief that the next session of Congress would grant their request, determined to proceed as though the enabling act had passed, following the precedent of 10 states, all of which formed constitutions and secured their admission into the Union without enabling acts from Congress. Wyoming proceeded to organize for statehood and an act admitting it to the Union was approved by President Harrison on July 10, 1890. Almost as soon as news of the passage of the act of admission reached Cheyenne, preparations were commenced for a proper observation of the victory that had been gained by the people of Wyoming. July 23, 1890 was selected as the date, and invitations were sent to all parts of the state asking citizens to join in the demonstration. I. S. Bartlett, editor, History of Wyoming, Volume I, S. J. Clarke Publishing Company, Chicago, 1918.